Pielke Jr. demolishes IPCC Lead Author Senate EPW testimony | Watts Up With That? The politicization of climate science is so complete that the lead author of the IPCC’s Working Group II on climate impacts feels comfortable presenting testimony to the US Congress that fundamentally misrepresents what the IPCC has concluded. I am referring to testimony given today by Christopher Field, a professor at Stanford, to the US Senate. This is not a particularly nuanced or complex issue. What Field says the IPCC says is blantantly wrong, often 180 degrees wrong. It is one thing to disagree about scientific questions, but it is altogether different to fundamentally misrepresent an IPCC report to the US Congress. Below are five instances in which Field’s testimony today completely and unambiguously misrepresented IPCC findings to the Senate. Field’s testimony is here in PDF. Have the Peoples’ Representatives really so little sense of reality, become so completely divorced from original sources that contradict this testimony in toto, that no-one rises to correct this shill or even flip a page to a relevant IPCC passage? If this is Congress’s idea of “fact finding,” what next– can anyone at this so-called “hearing” prove the world is NOT governed by invisible flying rabbits? Well, then– here they come. Unreal !! He can give his own opinions about the state of research, but such blatant misrepresentations of what the IPCC actually said are outrageous. Of course with a committee chaired by the pitiful Babs Boxer this is simply playing to the “majority”…. Still incredible since the claims could be so quickly and clearly refuted. Dr. Roger Pielke jr shows clearly that IPCC Lead Author Field didn’t simply mislead the Senate he outright lied. You have to call a spade a spade and a lie a lie, a suit and tie does not make you a honest man! Field is certainly entitled to his (wrong) opinion on the science of climate change and disasters However, it utterly irresponsible to fundamentally misrepresent the conclusions of the IPCC before the US Congress. He might have explained why he thought the IPCC was wrong in its conclusions, but it is foolish to pretend that the body said something other than what it actually reported. Just like the inconvenient fact that people are influencing the climate and carbon dioxide is a main culprit, the science says what the science says. Field can present such nonsense before Congress because the politics of climate change are so poisonous that he will be applauded for his misrepresentations by many, including some scientists. Undoubtedly, I will be attacked for pointing out his obvious misrepresentations. Neither response changes the basic facts here. Such is the sorry state of climate science today. Knowledge and understanding are not qualities abundantly available in any political forum I have encountered. Most of them will accept any information that suits their ideological agenda and automatically reject or discount anything which counters it. Sadly, the knowledge/understanding of ‘peoples representatives’ on any given complex subject is inversely proportional to the amount of money available for the lobbyists and their supporters. About three-four months ago (times of failed Scafetta flourish on WUWT) I finally got proof that the real natural variability is easily calculated from already known solar and geophysical variability. Fiercer the AGW-sceptics warfare the more value in understanding natural variability. The AGW camp has no clue, the ‘BEST’ is a contradiction of terminology, Scafetta and planetarists have failed to make an impact. Hey, doing science with obscure correlations is lot of fun especially if you can get what no one else has. I recommend to read the comments by A on RPJr’s post. Or even better, take the transcript and the SREX and compare them yourself. Field could have done better, but he neither lies (Re: DaveG) nor “unambiguously misrepresent”s. Field’s graph appears to show that NOAA has been above the 95% confidence limit (presumably based on Berkeley) fairly consistently since about 1983. Should I have confidence in the confidence limit or in the NOAA records? Now’s the time for our well-organized, well-funded denial machine to roll out a pre-packaged TV-ready episode consisting of extracts from Field’s testimony interspersed with video’d responses from Pielke. At least Fox should run it, and hopefully some local stations too. Now if only the Senate sub-committee members would read Pielke Jr.’s blog. The problem is these misrepresentations were *said* to the Senate subcommittee and no one *there*, at the meeting, stood up and pointed out the these misrepresentations. Nothing is going to change from Roger’s great insight unless there is some other way to loudly point out to each and every member that they just, basically, got lied to, and here is the proof. Is it a crime to mislead Congress? Field has obviously trained at the Gleick School of Ethics. You make great points about fact finding at this hearing, but would it make any difference to them? Does the majority not have and support their true agenda of additional taxation and control, regardless of how they get there? It’s Pielke Jr. taking the testimony (and the state of climate science) to task, which speaks volumes in and of itself. They indicted Roger Clemens on similar charges, but those charges did not stick. Will they at least follow thru and pursue indictment of this clown on the same basis? Probably not. Climate ‘science’ is rapidly approaching the single digit approval rating of Congress and the propaganda media. The EPW Minority must demand a public retraction of false testimony by Field, then strike all testimony by any discredited witness. Finally, Field must be barred from any future testimony or evidence. Big lies begin with half-truths. Removing one bad apple from the Faux Science barrel will not end the rot….but will be an ominous warning….some Earthlings are serious about Truth. So, is anyone sending this stuff to the Senators? Anyone slipping the truth in along with their morning coffee? It’s no good all this being said out here. It needs to reach Congress. There must be some Senators willing to listen – and hopefully pull Field in for further (tighter) questioning. Hasn’t this gone on long enough? Field has been caught lying to Congress, isn’t that a crime in the USA? There must be a procedure to raise this issue and make a formal compliant to Congress and get the authorities looking into it. This is a serious matter. Let me see if I’ve got this right. . . . The lead author of the IPCC report. . . . .lies about his own report? Why in the world would they put him on the stand to do something like that. . . . .something that’s so obviously and quickly impeachable? Wow. . . . . its sort of like this is never never land. . . . . . .
It’s just another UNFCCC conform social scientist? Lies, damn lies and statistics (to be clear I am not accusing anyone of telling lies). Storm or disatster costs are subject to many things even if the frequency of disasters increase or decrease year over year. Population increase, urban planning, storm water management, inflation, etc. Without taking all of these things plus more into account conclusions are just conjecture. My take on the hearing: Babs ran it like a kangaroo court. She asked “gotcha” questions and didn’t allow time for the scientists (esp. Christy) to explain their answers. And in science, there are no quick yes or no answers to any important question. Babs and Christy were in effect speaking different languages: Babs asks, “WHO was taking biased measurements?” and Christy thinks she’s talking about bias in the data caused by structural factors surrounding the weather stations. They never did get it together. I could never stand to sit there in that hearing room and let complete ignoramuses plot together to suppress the truth! The damage is done. The media will run with the quotes. The only thing that might get the media to backtrack is if Fields is charged with Contempt of Congress. Field was doing his job , what you need to release is that job is not science . Yes, please read the nearly incomprehensible “A” and Dr. Pielke’s replies. “A’s” comment on point 1 is particularly tortured, trying to suggest Field is talking about climate changes and extreme weather, not losses. I wonder what the phrase “14 billion-dollar climate-related disasters” refers to if not economic losses. Dr. Pielke’s response is directly on point. “A” doesn’t fair much better on the subsequent issues. Babs Boxer, during one of the committee witch hunts looking into possible “collusion” after one of the gasoline price spikes a decade or so ago (to the assembled eminent economists who were saying no evidence of collusion was found): “Well, I’m all FOR supply and demand and all, but … ” [your findings don’t fit my anti-Big Oil narrative, so yada yada …] It was comical but also sad to witness the unabashed politicization of science even then. I recommend to read the comments by A on RPJr’s post………. I agree. Excellent lesson in smackdown without being offensive by RPJr. I do have to give ‘A’ kudos for engaging in a civil debate though. Outrageous. But we don’t indict banksters so don’t expect anything to happen to him. Now going after a guy like Roger Clemons, now that is important, so he needs to be indicted. Reading tea leaves with coffee grounds. Field looks uncannily like Dr Harold Shipman….shudder! AGW was to be the ruse that created a sense of crisis so that ordinary citizens would voluntarily submit to the kind of collectivist schemes that have never worked in the past. Unless you belong to the politically connected class. Except this time the form is to push regulation and to tax away benefits of ownership and award govt largesse to connected companies. Freezing was the preferred theory for a while and Club of Rome books from the 70s make it clear any rationale will work. It’s the political, social and economic transformation and control over personal behaviors that the point. If the working definition of Corporatist Socialism is a planned economy and intrusions into what a citizen may say, do, or feel , we are there. Yes, I am aware of other names for this political racket from the past. But what’s important first is to capture the essence of the fundamental relationships involved. Then we can bring in other notorious names for these practices where political power seeks to override reality. All, this thread is what is wrong about the climate change debate. I scanned Field’s testimony and the blogosphere replies, so do not yet have this nailed excpt for the following. Not clear worth further effort, since the trends are clear. How about not ‘yelling’ past each other, and engaging? Weather related economic losses are real. Question is what, if any, AGW contribution. Now Fields asserted everything, without a shred of proof. You all are asserting nothing, also without giving a shred do proof. The laws of physics say carbon dioxide is a greenhouse gas. It must increase warming at least a bit. But there are other important factors. It is the future influence of those factors, not today’s weak climate signals relative to a very (as AW showed via surface station siting) noisy background, that matters. In the military you are taught not to attack all targets (lest waste all ammunition). Advise you follow this doctrine. As I did on a previous post here about provably wrong corn yield consequences. You want to stop the nonsense, then ‘shoot to kill’. Don’t do what the Taliban does, which is spray and pray. Specifically meaning taking AK47s and just pulling the tigger in some general direction. AW ‘shot to kill’ with his surface station study. Emulate that. There is some evidence hurricanes up-the-East-Coast are to some degree influenced by the warm AMO. Of course, this has nothing to do with CO2, which would suggest a reason to downplay the connection. If people were aware the AMO has been warm, and that the “trend” would be more hurricanes up the east coast until it cools, they might expect a repeat of 1893, or of 1954. If you say there is no “trend,” people will not expect another Carol-Edna-Hazel season, and when it happens it will be more possible to point at CO2 as a culpret. I’m an alarmist, but not about CO2. I’m nervous about a repeat of 1954. We’ve been pretty lucky, so far, this warm AMO. I thought Irene was “The Big One,” but it was slow enough, and in over the cold shelf waters, and the eyewall fell apart. I hope our luck continues. One of the big mistakes we make as skeptics is judging the other side by our own standards. I have been known, on occasion, to tell known lies, but for the ‘right’ reason. For example, I told my kids that Father Christmas was real, even though I seriously doubted the proposition. But it was done for a good reason and I would do it again. If you want to ponder the issue of “yelling past each other” I suggest a long, hard stare in the mirror. Dr. Pielke Jr.’s comments were not in any way, manner, shape, or form about the reality of AGW. They were about Field’s misrepresentations lies concerning what the IPCC had to say about the matter. You need to work on your English comprehension skills. You foolish people. He was brought in to say exactly what he said. The whole point of him being there was to give a scientific imprimatur for that exact view point. It’s over. Done with. It is now part of the congressional record and congressmen can point back to it as the scientific basis of their legislation. If it wasn’t him, it would have been someone else. Listening to a NPR broadcast today about gay marriage they had a theologian present to refute arguments that homosexualism was religiously proscribed. Not that I’m one way or another on that particular issue, but it points out that those the left brings forth to “testify” are going from a well rehearsed script. They will find someone with sufficient credentials who will say whatever it is they need them to say. Come’on! You guys have figured that out by now, right? The “graph” on page 3 of the pdf needs addressing as it states, simply and cleverly, that the number of record highs is increasing. If the world is cooling then it is surely inconceivable that we are experiencing more and more record highs. As a confirmed sceptic this is the first piece of information (evidence?) which has caused me to doubt my views. If you are under oath and you lie, yes. The thing that really drives my skepticism, is the lack of locusts. True Believers of the global warming are looking pretty silly riding their pink donkey to the capitalism-free Utopian dreamland of the Left. But, something is wrong when to get there the Left just can’t stop the lying. The scientific method places the onus entirely on those making the claim. The claim [actually, a conjecture] is that CO2=AGW. Skeptics do not have to offer ‘a shred of proof’. That is the job of those proposing the AGW [and much more preposterously, the CAGW] conjecture. They have failed. Although radiative physics implies that because CO2 absorbs and emits IR the atmosphere should heat up, empirical observations indicate that more is at play. Because the planet is not warming as endlessly predicted. Quite the opposite. 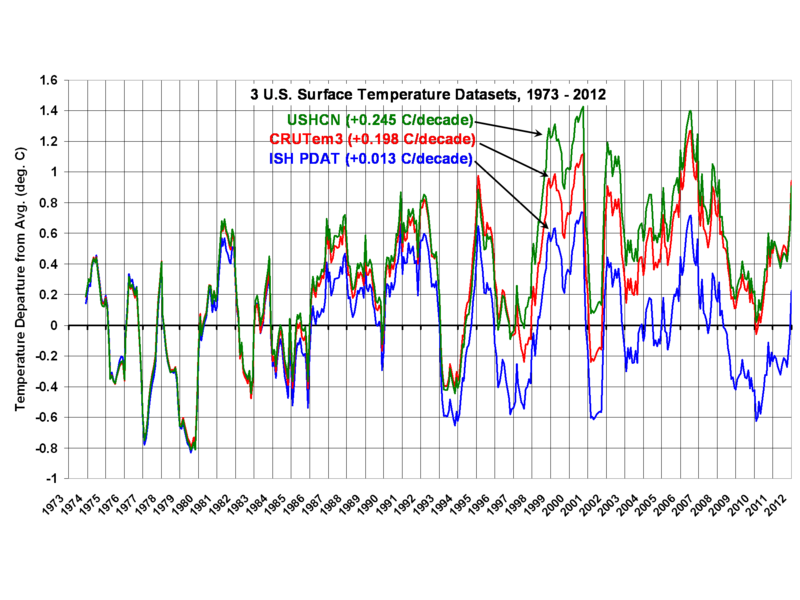 There is not a shred of testable, verifiable scientific evidence showing that CO2=AGW. None. The alarmist crowd has completely failed to make a scientific case. According to the scientific method, they must now discard their falsified conjecture, and formulate a new one. Scientific probity requires it. What does he teach, Climate Scientology? Global Warming Justice? Excuse me, did this distinguished person just… well… LIE? How very unusual. Can anybody give me 1(one) example of a climate scientist who did tell the truth, the whole truth, and nothing but the truth? another farce for MSM & public consumption. Hydrogen-fuelled taxis, introduced in London for the Olympic Games, are being transported on a 130-mile round trip to Swindon to refuel. The fleet of three low-emission cabs was introduced to ferry VIPs and officials during the Games. In the meantime, the taxis are loaded on a transporter to make the trip to the nearest filling station at car manufacturer Honda’s plant in Swindon..
Richard Kemp-Harper, from the government-run Technology Strategy Board, said the situation was “short term”. “The benefits for those taxis – apart from showing off some great British technology to the rest of the world – is actually that they produce water out of their tail pipes,” he said. Agency, or Office staff employees “invited” to testify at today’s hearing. None of them want to testify under oath unless they control the questions. Did he testify under oath or merely held a presentation for entertainment purposes? There is a difference, at least there used to be one in pre-postnormal times. Corresponding climate–ecosystem–soil simulations accounting for rising concentrations of background greenhouse gases and orbital forcing show that the magnitude and timing of the PETM and subsequent hyperthermals can be explained by the orbitally triggered decomposition of soil organic carbon in circum-Arctic and Antarctic terrestrial permafrost. Whenever I read Joshua I feel the life draining from me. The guy is just numbing, predictable, and dull as a re-run. Which is applicable to just about everything he ever says. He is someone who will never have a light go on and there is no point in taking his bait and debating him. His entire purpose is to blunt the conversation – to drive away audiences. It works. Isn’t it a criminal offense to lie in your testimony to congress? When can we expect an arrest? Will Stanford revoke Christopher Field’s tenure? Lets write both the presidents of Stanford and of their alumni association to find out what they think and plan to do. Do they plan to change the code of conduct for students to allow them to cheat as well, or is this a privilege reserved for staff only? This reflects very poorly on Stanford as an academic institution. If they do not act promptly then they rank down there with Penn State in the ethics department. Entropic Man: “Try this one. Eh? Why that one and not the paper blaming dinosaur flatulence? Both are larded up with ‘cans’ and ‘coulds’. And both are as equally testable and replicable. But only the one that intersects Central American Cuisine with Sauropods gets the hook right for climate catastrophe caused by fauna. Pielke and Cristy do a Tag Team Double Slam Down. One attacks the messanger, the other the message. Blam! Ow! Splat! ob, did you just get your head handed to you? You can learn a lesson from this. On WUWT, if you post a false claim then you will find that your claim is quickly and graphically revealed for the falsehood that it is. This environment is toxic for trolls. Of course, some trolls are so far out that they are ignored by all. Wow! Smokey smokes someone. Hats off to you, Smokey. Go to Pielke Jr’s website. There he spells out Fields’ lies or prevarications in excruciating detail. The unbelievable embellishment is just amazing. I see the same stunt so often, it has become commonplace to have no rebuttal of statement. Not this time! Mc at CA has expanded Pielke’s treatment by comparing the IPCC zero and first order drafts to show how evidence (i.e. cited publications) has been expunged to hide 1000 year drought patterns. He opines that the first draft was better. I read all your posts and most of it is way over my head but you are doing the good work. I will re-tweet and help you spread the truth the best I can! Keep up the good fight–spread the truth! Whenever I read Joshua I feel the life draining from me. The guy is just numbing, predictable, and dull as a re-run. Yes, does “Joshua” get paid for such trolling?? It is unbearably tedious to read him and I do it as little as possible. One could lose brain cells trying to read trolls like Joshua…. btw, Pielke Jr. has certainly stirred up the hornets’ nest….. the CAGW propagandists can’t bear to have one of their IPCC “lead authors” shown up for the scheming tool that he is…. Pray tell how an event millions of years ago qualifies as testable and verifiable? Really. The warmers sound more ridiculous each day. You know who you are. Entropic Man provides a pointer to the abstract of a paper behind a paywall. If there was a proof that carbon dioxide led to the heating of the atmosphere, it escaped the authors. Congress wasn’t mislead. Some of them heard exactly what they wanted to hear. Mr. Pielke Jr., do you understand politics? Come on you global warming “skeptics”! Wake up to what the world really is! Its worth having a look at the comments under Pielke Jnr’s post – several of the usual team cheerleaders (Dana1981, Joshua) can see nothing at all wrong with Field’s testimony. The tenacity with which they deny the blatant, brute fact that Field was LYING is typical, but instructive. These people appear to have no moral compass at all when it comes to promoting their ideology. Yes, there still is a difference. If you’re not under oath and you lie in congressional testimony, you can pretty much say whatever pops into your head without fear of repercussion (except for being embarrassed when/if you’re called on it). If you’re under oath and you lie, you are guilty of perjury. My genuine concern, is that this kind of misrepresentation indicates that the scientist has been ‘turned’ and ordinary folk are blind to it. There are many scientists who genuinely believe a ‘pet’ theory is valid until shown otherwise – but, as a rule, not many will deliberately misrepresent information just to support/promote that theory. The morally sound scientists prefer to work it through until the proof is (or isn’t) there. Of course, climate science is different! and such things are common place, which is exactly why we are in the mess we are in. Yet another example of Mannian Science at work = hokey schtick science based on lies and fraud, presented as fact. I am referring to testimony given today by Christopher Field, a professor at Stanford, to the US Senate. Oh come on………….be fair to the guy. Four big international companies, including the oil giant Exxon Mobil, said yesterday that they would give Stanford University $225 million over 10 years for research on ways to meet growing energy needs without worsening global warming. Between about 55.5 and 52 million years ago, Earth experienced a series of sudden and extreme global warming events (hyperthermals) superimposed on a long-term warming trend1. The first and largest of these events, the Palaeocene–Eocene Thermal Maximum (PETM), is characterized by a massive input of carbon, ocean acidification2 and an increase in global temperature of about 5 °C within a few thousand years3. Although various explanations for the PETM have been proposed4, 5, 6, a satisfactory model that accounts for the source, magnitude and timing of carbon release at the PETM and successive hyperthermals remains elusive. Nothing I can do about the paywall. Even scientific journals have to cover their costs. Try this a a possible mechanism for CO2 release . Warming in the Arctic is encouraging birch forest growth which is accelerating tundra soil decay. The result is increased net CO2 output. It is not so much politicized as corrupted. These maroons have made so much money and so much social status off of climate hype that politicization is no longer adequate to describe what they are diong. Kudos to Roger Pielke, jr. for having the nads to point out this sad example. It’s in the congressional record so it must be true! A paid liar speaking to other paid liars. No problem there. Unless there is a major change in the US in November this will all continue to the detriment of our country as well as others. Try this a a possible mechanism for CO2 release . You responded to a challenged to present testable, verifiable scientific evidence showing that man’s CO2 emissions are causing catastrophic climate change to occur. You instead offer an unproven and theorized mechanism as a proof. Do you not understand what proof constitutes? Or is logic not one of your skills? You send this post’s conversation down some tangential rat hole with your “try this theory” and “try that theory” approach, inundating us with pay wall protected articles that when examined do not even offer the proofs that you claim they offer. Why do you try to waste other people’s time with your mendacious posts? You clearly have an agenda and it is not the pursuit of truth. What did you expect when the science and policy debate ended? There will always be a need for regular biased updates on the progress of biased science once the end of the debate is declared. How do I find the IPCC report online so that I can verify and show others what it actually said. The IPCC reports can be downloaded from here. I must have been elsewhere when cAGW was falsified. Show me the evidence, please. No doubt you were attending the Church of Globaloney for services when I explained to you that the Null Hypothesis falsifies the alternate conjecture of CO2=CAGW. Wake me when/if the long term rising temperature trend exceeds its parameters. Then we will know that temperatures are accelerating. But so far for Mr. E, no joy. Not a single mention of Dr. Christie in the whole article. We generally survive our American politicians but your odds with British journalists may be cause for concern. Based on his blatant BS, I’ll speculate that Dr. Field was NOT testifying under oath. The good Dr. North was rather mealy-mouthed in his public comments about the validity of Mann’s hokey stick, UNTIL he was placed under oath. UNDER OATH, Dr. North stated that his committee’s conclusions agreed with those of the Wegman Committee. DR. NORTH. No, we don’t. We don’t disagree with their criticism. In fact, pretty much the same thing is said in our report. Massaged data and Urban Heat Island effect. My local station (rural) routinely has 2 to 3 degrees Fahrenheit added to the raw numbers for the reported high. Interesting that there are plenty of “look how clever we are and how stupid they are” type posts yet no one has offered a non-emotional response to the chart on page 3 of Field’s testimony. Essential that what seem or may be valid comments be addressed. Is there a counter to Field’s indication that in a world that is said to be cooling, the % of record highs is increasing? Surely the two are mutually incompatible? That must have been it. Since I missed the memo, show me, or give me a link to, the calculation which demonstrated that the Null Hypothesis was correct, especially the level of significance it achieved. I prefer evidence to verbal assurance. In a short blog you cant have everything. I notice that you ignored the real question. Does Senator Inhofe take political donations to promote an anti-cAGW agenda in Congress? In my country a politician who was paid to raise an issue in Parliament would be rusticated at best, or be prosecuted for taking bribes. Even events millions of years ago leave evidence which can be analysed, in sediments and sedimentary rocks. This is probably the most comprehensive summary of the evidence presented for cAGW. The source is IPCC AR4, but resist the temptation to reject the evidence because you do not like the source. That is tobacco lobby tactics, not scientific debate. I look forward to the evidence you present to falsify these statements. All you have to do is search WUWT, that turd was buried years ago. Six (6) responses since my comment, and your total “evidence” consists of the self-serving, repeatedly discredited UN/IPCC?? I suppose you are trying to make up with quantity what you lack in quality. And are you on a payroll where your job description allows you to comment on blogs? How great that must be! Dr Spencer is explaining the Null Hypothesis, which deconstructs the alternative hypothesis of CAGW, for which there is zero empirical evidence. None. There is no real world evidence that CAGW is occurring. Natural variability fully explains all observations; it has all happened before, prior to the industrial revolution and to greater extremes. So, who should we believe? You, with your belief which is unsupported by real world evidence — or an esteemed climatologist? Readers may decide for themselves whether to believe in runaway global warming and climate catastrophe. Me, I think it is preposterous. It is like worrying that there is a black cat lurking under your bed at night. You’re certain of it. But when you turn on the light… there is no cat! And there never was. Same with catastrophic AGW. Now there’s a statement you should be able to prove. The rest of your post is more tobacco lobby rhetoric. Once the tobacco lobby realised they could not falsify the evidence , they used public statements of vague doubts,ridicule, paid “experts”, ad hominem atteacks on researchers, donations to politicians, etc. I refer you particularly to the section on countering critics. I’m a retired science teacher. I’m here to debate the science, though , disappointingly mostly I’m just getting abusive comments from people protecting their turf rather than their science. Unlike Senator Inhope I have no possible financial incentive. Not sarcasm? It certainly sounded like it from my perspective. Thankyou for your having – at last – posted something I can applaud. I’m a retired science teacher. It is certainly a great blessing for your students that you are a retired science teacher. Richard, I’m glad to be retired too. Teaching is a hard profession. The students of mine who went on to become doctors, nurses, biomedical scientists, medical physicists, microbiologists,radiographers or other science professionals might disagree with you. Never had much contact with the real world, have you?